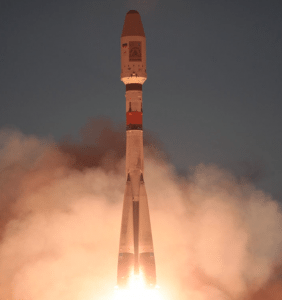 [Via Satellite 07-09-2014] On July 8, 2014 a Russian Soyuz-2.1b rocket carried Russia’s Meteor M2 weather satellite along with six small satellites for domestic and international customers. The launch took place at the Baikonur Cosmodrome in Kazakhstan. Built by VNIIEM Corporation JSC, Meteor M2 has a design life of five years and will study a variety of meteorological activity. Dauria Aerospace’s DX1 will be used for Automatic Identification System (AIS) data, Skybox Imaging’s SkySat 2 for high resolution imaging and video, and AISSAT 2 for tracking sea traffic around Norway. The NPO Lavochkin-built “Relek” scientific satellite is designed to study high-altitude electrical discharges, atmospheric phenomena and relativistic electrons from the radiation belts that pose a threat to spacecraft. The United Kingdom’s TechDemoSat 1 includes an infrared radiometer for remote sensing, and UKube 1 carries four payloads for the purposes of technology validation, near-Earth space research and education.